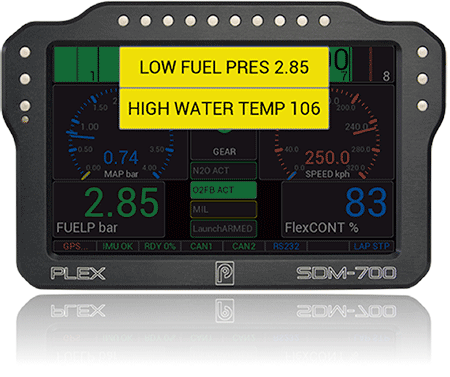 SDM-700® is a powerful 7” Pro-level Dash Display & Central Logger that is suitable for the most demanding of usage cases. Weighting less than 800g, it comes in a high quality , IP67 sealed, CNC aluminium enclosure and features an ultra-vivid, high-brightness anti-reflective TFT display. 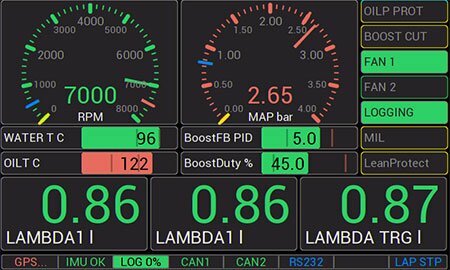 Combines best-in-class display functionality and UI with full spectrum datalogging and performance measurements. Comes with integrated 1GB memory, 50Hz GPS and 100Hz Inertial Motion Unit. Uncompromised quality with 1000cd daylight view 800×480 display. ARC type broadband anti-reflective coating. Easily viewable in all light & weather conditions. Up to 50Hz internal GPS module with ultra-fast start-up time (1-3 sec) enables accurate predictive lap-timing with section break down and raw data logging. 22 pre-loaded Smart Alarms require that you only input the trigger value. User defined alarms and alarm history (last 200) also available. Proprietary UI design ensures optimal viewability and reduced driver distraction by optimising smart colour coding and contrast for the driver’s peripheral vision. 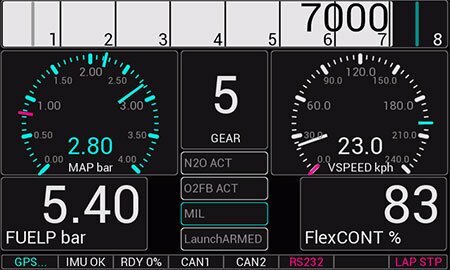 Hands-free display page changing based on user-defined conditions such as engine status and/or load to help you keep your attention focused. Ultra-fast built-in memory allows extreme logging rates. With luminance 1,000 cd/m2 the 800 x 480 display looks very vivid and is easily readable in all light conditions and from various viewing angles. The multi-layer broadband antireflective coating decreases surface reflections drastically, whilst increasing light transmission and eliminating “ghost” imaging. 16 fully programmable LED lights for advanced shift-lighting and other functions. Easily edit each LED’s colour, brightness and blink frequency and assign multiple functions (shift lights / warnings & status indications, etc). Lighting patterns coming soon as well. No delays, almost instant fire-up. A powerful processor and effective firmware design enables a total boot time of just 1 second. You just switch on the engine the SDM-700® fires-up immediately. Multiple display layout pages to choose from (we keep expanding the options), plus Pop-up displays, diagnostic, and statistics pages. All designed to offer best possible viewing ergonomics. Users can select to install the same layout many times but with different channels and name them accordingly. The Auto Display Page Changing function allows you to keep your hands on the wheel and your focus on the track without having to manually switch among different page layouts. You only have to decide on the conditions and the parameters for 4 different display pages: “WARM-UP”, “RACE”, “ERROR” and “NORMAL” and also 4 custom “OVERRIDE” pages. Once the thresholds are reached the SDM-700® will automatically switch to the respective page. 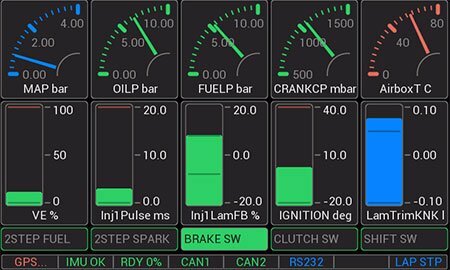 Configurable 3-level parameter colour-coding minimises distraction and communicates engine status easily with just a quick glance. How does it work? 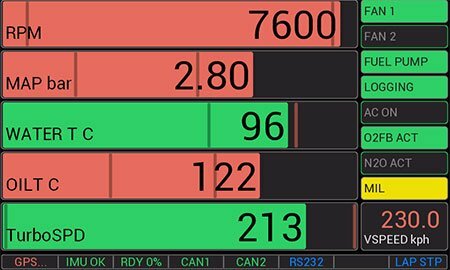 The user defines the low (BLUE), normal (GREEN) and high (RED) thresholds for each displayed channel and the SDM-700® colours it accordingly once the values hit that range. Your peripheral vision will then let you know almost instinctively when something is out-of-place and if it requires your extra attention. Instead of trying to impress with fancy realistic graphics, overly contrasted display items and ineffective fonts, we chose to implement the most effective combination of font type / size, colour palette and contrast levels that is derived from aviation dashboard design and colour theory studies. Priority is placed in having effective display items that require the minimum driver attention and achieve a “magnifying” effect making the SDM-700® come across as larger than just 7”. LOW Values Depicted in "BLUE"
HIGH Values Depicted in "RED"
With a firmware update meant to be release soon, you will have the chance to easily create your own display pages by choosing and arranging any of the display page objects according to your preferences. You will also be able to create your own colour theme and hence match the SDM-700 to your project’s colour palette. 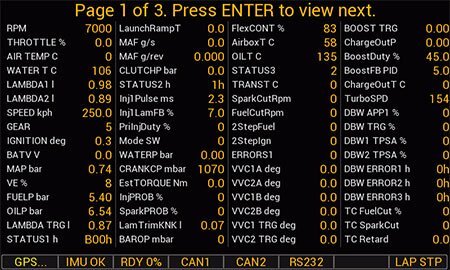 Our most advanced Engine Log yet, provides a detailed snapshot of how your engine has been used with the possibility of displaying up to 16 different min/max values, 16 accumulated conditions time, alarm accumulated times and last 400 alarms log. Soon, you will be able to view this also on the device apart from the PC. 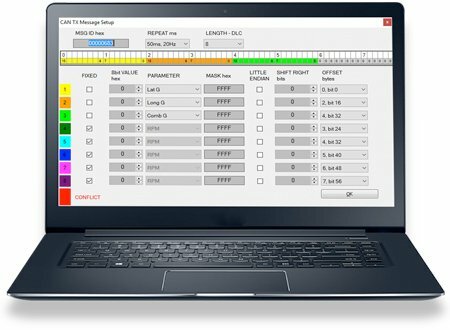 Similar to our SDM-500® you will soon be able to edit the configurations of the SDM-700® easily with with external buttons. Basic datalog review will also be possible on the device, without the need for a PC. This is a great feature especially appreciated when time is tight and particularly in between runs. The new PLEX Data Analysis WIN PRO Software® (PLEX PDA-WIN PRO) is one of the easiest, fastest and most versatile data analysis & visualisation solutions available that is meant to shape the way racers benefit from logged data by saving time & enabling smarter decision making. 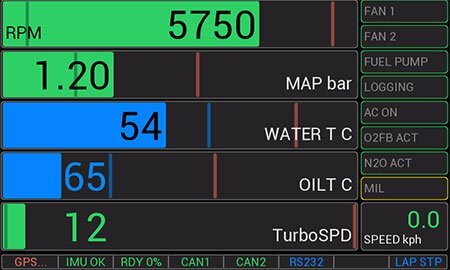 The intuitive UI and customisation options help one decipher complex engine, race, driver & tuning data by visualising it in easy to interpret & compare graphs, tables and other analysis components. Additionally, its .csv file import function makes it suitable for any logger, ECU and display. Get the PLEX PDA-WIN Pro®and race based on facts, not intuition. User defined layout of tabs and panels with handy panel docking similar to latest Windows SW suite. 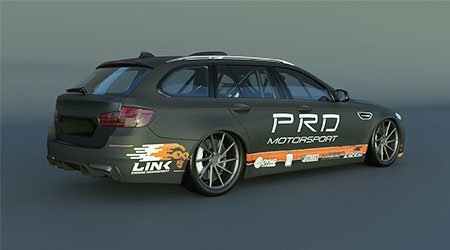 Seamlessly switch between single and comparison view even for completely different file types such as a dyno run with a track lap. Keyboard shortcuts for the main menu and panel functions speed up the set-up time and real-time analysis considerably. Zoom levels & cursors are linked among all analysis panels/graphs allowing automatic rescaling & cross referencing of data. Create and keep track of events, tracks, drivers, vehicles and engines for easy referencing and historical data tracking. 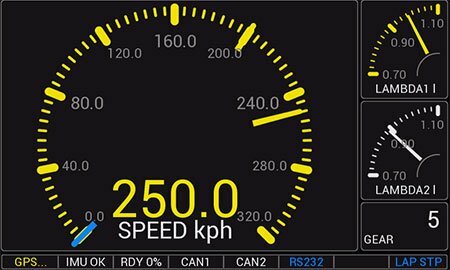 Line-graphs, navigation graphs, XY graphs, histograms, gauges, track-maps, tuning maps, laps/runs reports, data values at cursor and more. 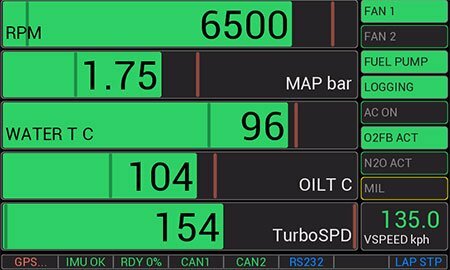 Optimise your fuel and ignition maps by analysing the log data in tuning maps with the same breakpoints as your ECU. 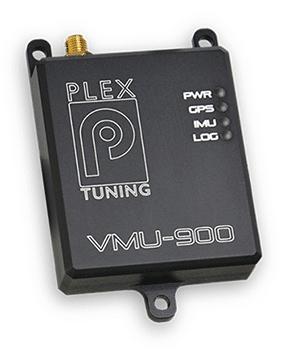 An integrated 50Hz GPS /100Hz IMU module enables very accurate measurements for a variety of applications such as driver analysis, lap timing, vehicle trajectory analysis, track mapping, acceleration-decceleration. It functions also as a full-fledged, always-on Performance Meter. In fact, the SDM-700 includes a complete VMU-900 which you can also buy separately as independent module or add-on for other products. 22 pre-loaded Smart Alarms which only require that you input their trigger value reduce set-up time by more than 80%. Alarms will then appear superimposed in high contrast over the display page according to set priorities. A history of the last 400 alarms including their date, value and duration will be stored in a log for later retrieval on the PC SW. Customs alarms with multiple conditions can also be created using any of the available data channels. 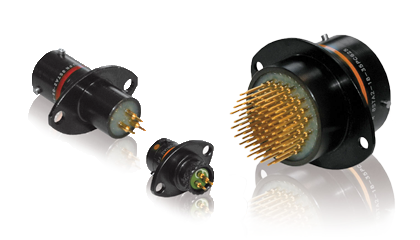 High quality motorsport 37pin connectors by Souriau (1x on basic version, 2x on pro version), designed for applications where high-performance, small size and lightweight are key factors. Made of rugged IP67 aluminium. Up to 32 user-defined math channels allow custom parameters to be calculated in real-time. Examples include break bias calculation, long-button hold detection, accumulated condition active time, filtering and more. 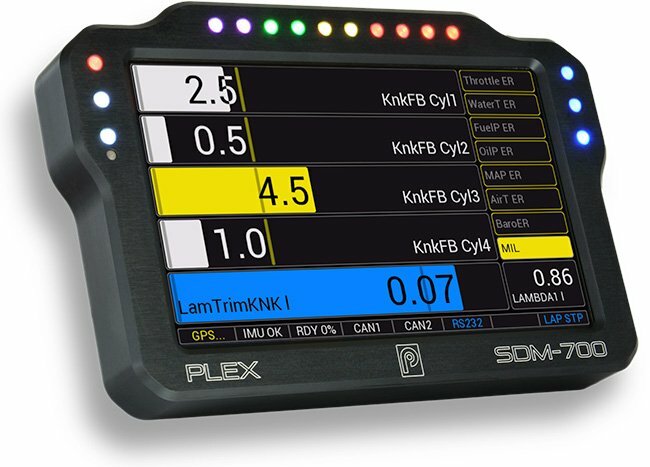 Depending on your ECU’s capacity and the connected sensors, the SDM-700 can display up to 1024 different channels (pro-version) among which are ECU status and error flags. Always be in the know of what’s going on inside your engine. 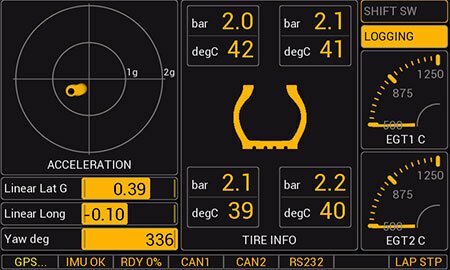 Up to 4 fully-programmable CAN BUS ports lets you configure the display to collect information for almost any CAN Bus ECU or other device on the market. Configurable message transmit lets you control other devices such as PDMs or translate message to a different format as required. 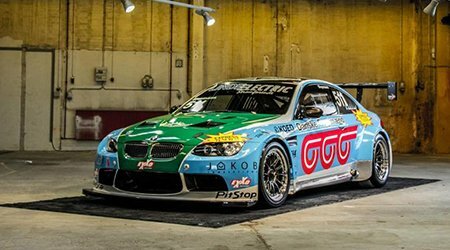 When setting-up a display for a project, the single most important attribute for tuners/race engineers is the required time. Our revised PLEX Device Manager® SW, provides the fastest and most intuitive configuration experience by reducing set-up time by up to 70%. You can now spend more time in tuning and testing than in customising and configuring the displays for your customers. Material CNC Alum. CNC Alum. CNC Alum. CNC Alum. CNC Alum. CNC Alum.